5. What happened to the U.S. Diplomats in Cuba?-- neurological symptoms in Havana, Cuba last year? Now it has happened in China! What is mass psychogenic illness? Coffee has been maligned because of the cardiovascular effect of caffeine on blood pressure (elevation) and cardiovascular health. A new report (British Medical Journal) has just reversed this overall trend for most people who do not have serious hypertension or cardiovascular disease. Guidance from an individual’s doctor is always required, since once a person hears there are benefits of any natural product, they could overdo it. Coffee contains 1000 bioactive compounds, many of which are antioxidants* with potential health benefits. *Antioxidants are compounds that inhibit oxidation. Oxidation is a chemical process in the body that produces free radicals that can create a chain of reactions that can damage cells in the body. Foods and supplements that have antioxidant capability counter these destructive reactions. 1- There is a 17% lower risk for all-cause mortality and 19% reduction in cardiovascular deaths for coffee (caffeine and non-caffeine) drinkers compared to non-coffee drinkers. 2- Coffee also lowers the risk of certain cancers (melanoma, prostate, and liver), and some liver conditions. 3- Both caffeinated and decaf coffee lowers the risk for type 2 diabetes. 4- In pregnancy, high consumption of coffee has certain detrimental effects: higher pregnancy loss, lower birth weight, and pre-term births. There is also a higher risk of fractures in females (not males). 1- a cup of coffee contains 5 calories 2- 1 tsp of sugar contains 16 calories 3- Half anf Half cream contains 37 calories for 2 tbsp. 4- Whipping cream contains 101 calories in 2 tbsp. 5- Fat free milk contains 10 calories in 2 tbsp. 6-This article stated that coffee should not be recommended as a health benefit based on these findings, rather coffee is safe to consume for most people. Over half of today’s U.S. children will be obese by age 35 if existing trends continue according to a report in the NEJM*, despite the fact that currently only 20% are obese (ages of 2-19). It is projected that 57% will be obese by age 35. The earlier obesity occurs, the more likely they will remain obese for life. Prevention is the only answer to this crisis. This seems paradoxical since obesity has declined recently among children between ages 2-5 and has stabilized between the ages of 6-11, however, obesity continues to rise in adolescents and young adults according to the lead author, Dr. Zachary Ward, Dept of Public Health, Boston. If a child is overweight at age 2, there is a 75% chance of obesity by age 35. If obese by age 19, there is an 88% chance they will be obese when 35. Severe obesity affects 4.5 million children currently in the U.S. Despite these figures, 50% of obese 35 year olds were not obese as children. That means over half will become obese after childhood. The parents of our children must listen up and begin dietary discipline as early as possible. If parents are over weight, they are very unlikely to discipline their children regarding diet and weight. “Parents must quit loving their kids through their stomach!” Do not make food a reward. People that are overweight tend to underestimate the number of calories consumed in 24 hours. In fact, one study stated that some obese people eat twice as many calories as they report. Obesity leads to type-2 diabetes, heart disease, stroke, orthopedic disease, disability, and an increased risk of many cancers including esophagus, colon, breast, prostate, kidney, and pancreas (American Cancer Society). C. Communicating with your doctor on electronic media; Wrong Health Information in your own medical record! Most people today have become social media savy, like it or not. Most doctor’s offices (especially those who are employed by larger centers), have websites that allow you to communicate with the doctor’s office, view lab tests, etc., and allow transfer of records to other doctors. In my experience, they are cumbersome and difficult to set up and navigate. But they are here to stay. Some are better than others. We are now asked to fill out medical records online before getting to the doctor’s office. It is very important to provide correct up to date information on your medical record since that permanent record will be online and mistakes can be perpetuated for years regarding medications, dosages, allergies, etc., and if they are sent to referring or consulting doctors, that just multiplies this issue. 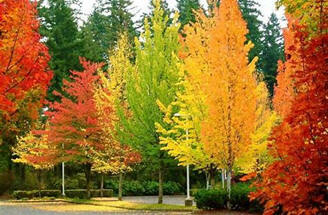 This form of communication is expanding and now some visits are handled on the phone, by email, or teleconference. Ask to check your online record for accuracy when you see your doctor. If medical information changes, be sure it is reflected in your records. A common mistake is stopping a medication and not telling the doctor which then will not be reflected on the medical record. Electronic medical records are not easily transferable to other doctor’s groups, because medical record software is not always compatible from one medical center to another. Medicine has a way to go to tackle this electronic age and mistakes can be made and those errors are hard to correct once in an electronic medical record. Quality of care is not better with electronic records, in my opinion!! It has cost physicians a bundle and taken away time from patients. The current medical environment requires a knowledgeable patient who knows the right questions to ask and insists on complete answers. This is the primary reason I spend so many hours writing these reports monthly to give readers information and resources which can better prepare them for doctor’s visits and getting more out of those visits, whether it is on the phone, on a website, or face to face. Keep records, follow up, take medicine as prescribed, don’t change medicines or add them (including supplements) without your doctor having a record of it. Do not assume a consultant sends any information to your primary care doctor. Request a copy of their records and take it to your doctor. Learn about your disorders and illnesses and how best to help your doctor manage them!! No excuses! Patients with serious illness need to know their rights and responsibilities when it comes to coping with serious illness. 1) Understand your insurance coverage, deductibles, and copays. Talk to your insurance carrier and get help if needed. Be informed. 2) Ask for reasonable accommodations at work, while ill, to prevent negative performance evaluations. Know about the Americans with Disabilities Act and your protection. 3) You may not have to quit your job just because of a serious illness. The Family and Medical Leave Act provides 12 weeks of unpaid, job and health benefit protected leave for eligible personnel. Know the criteria for eligible patients. 4) Prioritize your debt. Learn about secured and unsecured debt. Negotiations about debt are often accepted by medical facilities. Be bold! 5) Don’t take “no” for an answer from your insurance company. Know about the appeals process, and if needed, get legal assistance. Each year the flu vaccine is prepared based on the previous year’s actual strains of flu which occurred in the U.S. The CDC announced the new vaccine that will be used and can be administered this fall. One of the striking omissions in last year’s vaccine was less protection against the H1N1 pandemic virus, which which made the overall effectiveness less than desired. The vaccine this year has been changed to a live attenuated* virus (LAIV4), which uses an H1N1 virus to create immunity. Last year’s vaccine used a non-viable strain for production. *Attenuating a virus makes the virus less active but still allows for a good antibody response from the vaccine although a live attenuated virus may be more effective. 1) People with a history of egg allergy may receive safely any of the age-appropriate vaccines this year. 2) The Afluria Quadrivalent* vaccine may be given for those 5 years and up instead of 18 and older. 3) Fluarix Quadrivalent* vaccine may be administered at age 6 months and above instead of age 3 and above. *These 2 quadrivalent (called Fluzone High Dose) vaccines are 4 times as strong as the regular vaccine, and are usually recommended for seniors (among other special groups) because of their susceptibility to complications from the flu. 70-85% of the deaths occur in those over 65. The other reason for a stronger vaccine is that seniors tend to have poorer immune response to vaccines. Young children have not developed a mature immune system and may need a stronger vaccine. Those on immunosuppressive drugs (and patients with HIV, MS, transplants, cancer patients, etc.) may also need stronger vaccines as well. An NEJM journal article stated that these stronger vaccines provide a 25% better chance of preventing flu complications. However, if people have had a serious reaction to a previous flu shot, the stronger vaccine is not recommended by the CDC, since reactions may be slightly more prominent. When people get these mild reactions to the vaccine, they think they are getting the flu, but it is due to other ingredients in the vaccine. The American Academy of Pediatrics (as opposed to the CDC) does not recommend live virus vaccines for children and adolescents because the effects of the live influenza vaccine have yet to be proven it is effective against H1N1 flu. They recommend the inactive viral vaccine. Vaccination is recommended for all those age 6 months and up who do not have medical reasons not to. Young children, those over 50, and those with a chronic health condition should be vaccinated as a priority, since these groups are the most prone to have flu complications, and it is vital they be vaccinated. 82,000 Americans are expected to die from complications of influenza in the U.S. this year. For those who are anti-vaccine advocates, there is no scientific evidence that autism or other disorders occurs with the flu vaccination. For those who are not vaccinated, they are a hazard for the rest of the population especially when in schools and other areas where people are grouped together. “Herd” immunity is an important concept to understand, because when a community is vaccinated in significant percentages, this reduces exposure for some of those not able to be vaccinated. As we have seen some leveling off of teen smoking, the tobacco companies continue to innovate ways that appeal to youth (to start vaping with new and improved nicotine delivering systems). By 2016, 11% of highschoolers were using e-cigarettes (I suspect it is 15% now). Add this to those who use smokeless tobacco, and the cigarette companies are very happy. 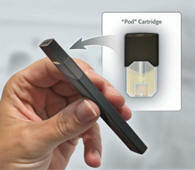 There is a new device for e-cigarettes called the Mod-Pod and is a big hit with the adolescent and teenage age group. They are easily concealed from authorities at school and parents. Note the similarity to a USB drive! These small rechargeable devices that aerosolize liquids containing nicotine into vapor. They are offered in several flavors (strawberry, grape, grapefruit, etc.) as seen in the above photo and the vapor is inhaled. Liquid marijuana can easily replace the nicotine cartridge. It is a dangerous device in young people’s hands and are one step away from smoking cigarettes in a large percentage. One of the most popular brands is “Juul” capturing over 50% of the market. They can contain 2-10 times the concentration of nicotine than a standard cigarette delivering . They look just like a USB drive, so beware parents….kids are sneaky when it comes to these things….kids are “Juuling” right in the classroom. But they are also naïve…one study cited 63% of youngsters age did not know nicotine was included in the pod-mod. It is scientifically proven that nicotine has negative effects on the developing brains. Six public health organizations and 11 senators have urged the FDA to take these pod-mods off the market and move up the date for reviewing e-cigarettes (currently 2022) and their harm and value. Because of this pressure, the FDA is in the process of insisting that these tobacco companies delete the flavoring from their product (still waiting!). Hopefully, this will deter some youth from vaping. They should immediately begin to evaluate the benefits and risks of these vaping devices. Although, in adults, it has some value in helping people from stopping smoking, it is an entry level drug form for youth. I just don’t understand why the FDA has dragged their feet in regulating the tobacco industry…..oh yeah…lobbyists and their donations to their campaigns. The tobacco companies will never give up pushing their “drug”. And these new pod mods are here to stay. Heartburn is a very common problem, and it is aggravated by reflux of stomach acid up into the esophagus, causing gastro-esophageal reflux disease (GERD). This condition can be aggravated by being overweight, having a hiatal hernia, or lying flat after drinking fluids (especially alcohol, coffee, or carbonated beverages), or eating fried foods. People with reflux should abstain from drinking any fluid for 2-3 hours before bedtime. 5% with GERD will develop a potentially precancerous condition called Barrett’s esophagus, but only 1% of those will develop esophageal cancer. However, when one considers 20% of the population has GERD, this condition is still serious and needs evaluation. This is diagnosed with an endoscopic examination by a gastroenterologist. Barrett’s esophagus is defined as a change (metaplasia) in the cells of the lining of the lower esophagus, which can, over years, become precancerous and eventually cancerous. Patients with resistant reflux should be endoscoped to look for the possibility of a stricture (narrowing from acid burns), hiatal hernia, reflux esophagitis, Barrett’s esophagus, or even a cancer. Biopsies can diagnose this condition. 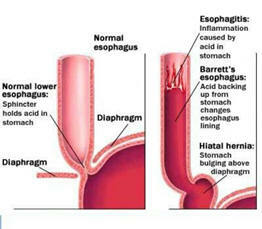 Note these 2 slides demonstrating Barrett’s esophagus. Patients with persistent reflux need to be treated with medications that reduce acid in the stomach (heartburn meds-PPIs and H2 inhibitors, antacids), lose weight, sleep propped up, not drink or eat for several hours before bedtime, not smoke, or drink alcohol and schedule an appointment with a gastroenterologist for an esophageal-gastric endoscopy. A recent study found that patients with Barrett’s esophagus do much better on a regimen of PPIs and aspirin and are more likely to prevent progression of this disorder. Perhaps the anti-inflammatory effect of aspirin may reduce the condition. 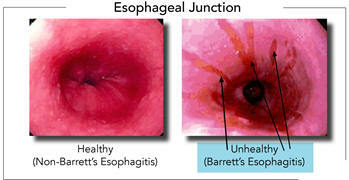 There are also procedures to endoscopically remove the Barrett’s esophagus condition if advanced. Radiofrequency ablation, laser treatments, cryotherapy, or an endoscopic sleeve removal of the tissue are all options used by gastroenterologists. Talk to your doctor about this new study about using PPIs and aspirin, and see a gastroenterologist if gastric reflux persists or there is a persistent cough with or without heartburn. The key to a healthy esophagus is to prevent reflux! There are other consequences of gastric reflux including reflux up into the throat with aspiration of acid into the lungs leading to pneumonitis and worsening of pre-existing diseases. Many patients have a chronic cough and present to their doctor with this symptom and not even realize that reflux is the cause. As an ENT surgeon, I saw this in my practice daily. This occurs most commonly while sleeping especially if not sleeping propped up. Choking and gagging at night can be severe and lead to chronic bronchitis, worsening of COPD, and aspiration pneumonia. It is called laryngopharyngeal reflux. A laryngeal exam by an ENT physician will show redness in the back side of the larynx and in the opeing of the throat into the esophagus (at the cricopharyngeus muscle, the upper sphincter of the esophagus. Note the redness on the part of the larynx that moves the vocal cords (arytenoids). Hoarseness can also occur because of the irritation of the vocal cords from acid. Symptoms of laryngopharnygeal reflux are: chronic sore throat, persistent cough especially at night, a sensation of a lump in the throat, hoarseness, and regurgitation, all causing chronic inflammation. Because these symptoms could be caused by cancer, allergies (postnasal drip, etc. ), patients must be completely evaluated with a thorough exam of the throat and airway by an ENT surgeon (endoscopic exam). Note the upper sphincter of the esophagus (cricopharyngeal muscle). Acid refluxes through that sphincter and then into the throat (pharynx), larynx (voice box), and lungs. 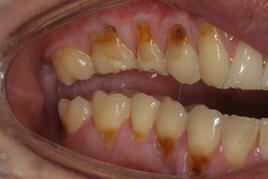 Not only the throat, larynx, and lungs can be injured with acid, but so can the teeth. 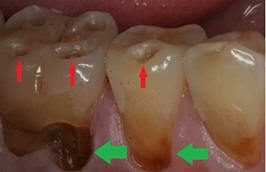 Over time, acid erodes the enamel of teeth creating pits in the teeth, and erosion of the gum line with exposure of the roots and erosion. If a dentist saw these images, they would know that acid reflux is a possible cause, I would hope. 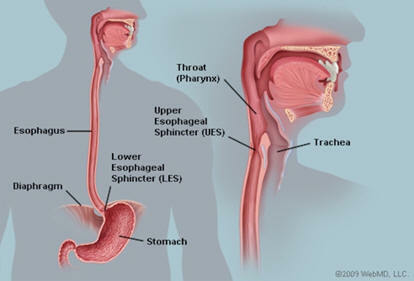 Gastric bands (the most common procedure) between the stomach and esophagus have not been that successful as described before, but there may be some help for reflux into the throat and lungs from a device gently closes the esophagus during sleep. 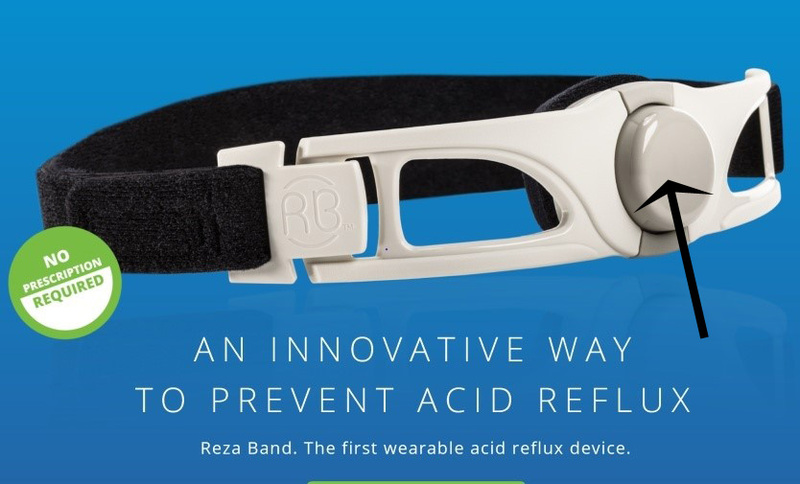 The Rexa Band (next page) has been FDA approved for some time, but recently it has been approved for over the counter sale. It might be worth a try but only if your doctor approves. I would think this would not be advisable for those with sleep apnea or COPD. One small study cited an 86% success rate. 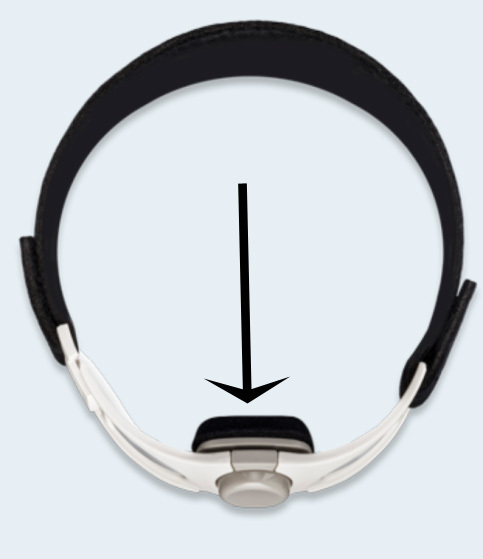 Toleration of this device could be a challenge since it sits on the lower neck below the larynx (voice box). Arrows below show the portion of the band that must be placed over the upper windpipe below the larynx (voice box). 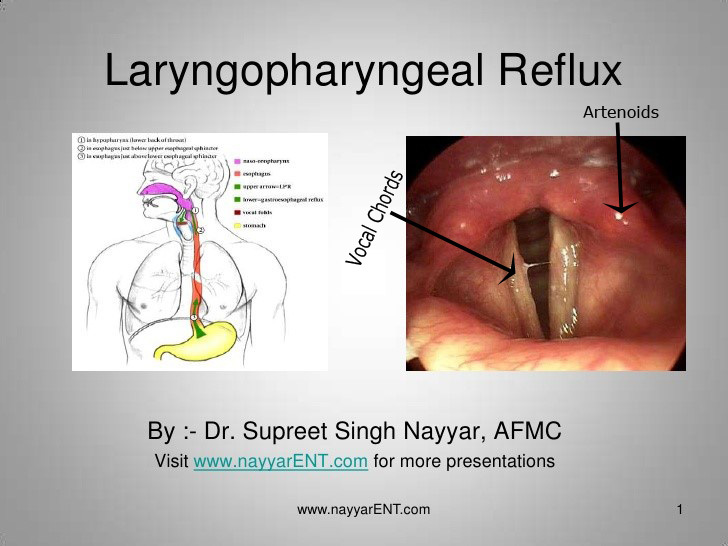 Laryngopharngeal reflux is a common problem seen in every ENT surgeon’s office, and if a patient had no evidence of pathology on exam of the throat and larynx, patients are frequently referred to gastroenterologists for an endoscopic exam of the esophagus and stomach. A pulmonary specialist may also be consulted if aspiration lung disease is suspected. Note that some of these patients may or may not have classic heartburn and stomach discomfort, and yet, the problem in the lungs progresses with silent gastric reflux. As the field of medicine has become more complex and requires so much more documentation (on electronic medical records), a physician’s time has been reduced caring for patients. Even though, I was able to provide on-the-job training for my main nurse and retained him for 17 years, many nurses change jobs often and are not necessarily specialty trained. The shortage and maldistribution of physicians continues. A recent study reported in the Journal of American Family Physician (August, 2018) that an analysis of 1278 health centers, 69% reported at least one vacancy for a family physician, up from 13.2% in 2006. These community health centers serve more than 27 million patients in more than 10,000 communities serving primarily low income, uninsured, or Medicaid patients. The salaries for physicians are much less in these centers than in private centers and clearly are a hindrance to filling vacancies. Some medical schools (NYU is one) have resorted to providing free tuition for school from grants and private contributions to encourage doctors to choose family medicine, because of the tremendous debt most medical students incur. However, many of these positions needed can be supplemented by physician assistants. In 1965, the first class of physician assistants was started in North Carolina and endorsed by the medical profession. The U.S. military was a great resource for these professionals, since the “medic” in the military was critical to provide medical care in time of war on the front providing emergency care and later their services were extended along side of field nurses. PA training programs began at Brooke Army Hospital in San Antonio, Texas, in 1971, and accredited by Baylor University. 70% of PAs are women, which is another factor in the shortage of nurses, discussed last month. Although the PA’s training starts with general medical training, specialty training is now available for PAs. Many of the medical specialties now count on additional medical help from PAs in the office and in surgery. PAs are trained by physicians as opposed to nurse practitioners, who go through nursing programs to qualify for nurse practitioner training. Today, it is unusual to go into a doctor’s office that does not have at least one PA. Dermatology and Family Practice probably lead the field in employing the most PAs but are looking for more PAs. It is the fastest growing healthcare profession. The percentage of P.A.s rose from 13.0% to 14.4% in rural and 8.9% to 10.8% in urban areas from 2008 to 2016. The American Academy of Physician Assistants is the accrediting organization that requires each student to attend an accredited school and pass a national exam to be nationally accredited and state licensed. PA students spend 2-3 years in classroom studies and their curriculum is based on medical education with the same subjects doctors take in medical school. That gives the PA an advantage over nurses, who are trained by nurses. Although they are not required to take residencies (physicians do), there are currently post-graduate specialty training programs in many of the medical specialties. I was proud to sponsor a student as an intern to further her interest in ENT, Facial Plastic Surgery, and Head and Neck Surgery, and she is currently working in the offices of a group of ENT surgeons. These PAs continue their education while employed and gain continued knowledge and skill. It is up to the individual doctor’s practice what the PA is allowed to do. In most states, they are allowed to prescribe certain classes of medications. The team of a physician and a PA has become commonplace and has expanded the number of patients that can be seen in the doctor’s office. It is the direct supervision of PAs that can assure patients that more difficult issues are seen by a doctor. PAs know when they get out of their comfort zone. Of course, patients can always request seeing a doctor for any issue, but making an appointment with the PA gets a patient quicker access. PAs often might prevent patients from having to go to an urgent care or emergency department in many cases. Patients have found they get more time with the PA than the doctor. Females may find it more comfortable to have their female exams by a female PA (specially trained) than a male physician. The VA is the largest employer of PAs in the country employing over 2,000 PAs. The U.S. Army PA serves as a Medical Specialist Corps Officer primarily serving in areas of combat but also throughout the world at military bases. They also serve in the USAF and Navy. As of 2016, there was over 116,000 certified PAs in the U.S. Their salary can range from $100-200,000 per year according to Money magazine and was listed as the 5th best profession in the U.S.
PAs can be found in most countries of the world. They have been a great addition to medicine and are a great career. The Federal Drug Administration is a U.S. Consumer Agency whose mission it is to protect the public from unsafe food, drugs, medical devices, cosmetics, and other potential hazards. It is a department of The U.S. Health and Human Resources regulating over a $1 trillion dollars worth of products which accounts for one-fourth of all consumer spending. Compliance is monitored by over a 1000 investigators and inspectors visiting over 15,000 food processing, drug manufacturing, and other facilities each year. If a violation occurs, the FDA encourages a recall or correction of the offense. If they do not comply, they are taken to court to seek criminal penalties against them, impose fines, and seize products, etc. Each year, the FDA declares about 3000 products and 30,000 import shipments unfit. The FDA also employs over 2000 scientists who provide review of scientific evidence from research performed by a pharmaceutical or other type of company that presents their findings with an application for approval to the FDA for approval. The FDA does not do research on these products. This creates a risk for the public because our government has to believe the company’s studies. Drug approval is a long and drawn out process taking an average of over 8 years. The sponsoring company spends an average of $359 million to bring a drug to market. If you ask Big Pharma, they will tell you the cost is $1.2 billion, because they factor in all their failures. That is how the drug companies rationalize their enormous prices for patients. They have gotten out of control and must be better regulated. The current administration is attempting to pursue this in various ways, but the lobbyists influencing the Congress is a tremendous impediment to progress in drug cost reform. I. Preclinical Trials—this requires testing on animals usually more than one species assuring the animals are properly cared for humanely. Most testing is rejected, but if it is approved, the drug or product must be tested on humans. Phase 1—Testing for safety and dosage level on volunteers. If the drug or product passes this phase, they go to the next phase. Phase 2—These tests are conducted on patients who have the actual condition intended to treat. Effectiveness and safety is the goal of this phase. Phase 3—This phase is conducted to review the findings of Phase 2 and just how the drug or product should be further tested taking usually 1-4 years. This phase again tests for effectiveness, safety, and proper labeling (marketing), how it is produced (pill, capsule, liquid, dosing), and packaged. III. FDA Final Review—A new application is presented for final approval. If approved, the production of the drug, manufacturing, and marketing can begin immediately. The FDA will then have a period of post-production surveillance consisting of surveys, testing samples, and analysis of reported adverse reactions. The FDA has been given the green light to fast track drug research to allow needy patients access to potential life sustaining medications by the Trump Administration. The trouble with fast tracking is that potentially dangerous drugs may be effective but the longer term side effects including death can’t be known and the lawyers love it. For desperate patients and families, it is a source of hope. Big Pharma is happy to pay out $millions in lawsuits because they are making $billions. It is interesting that the FDA is fast tracking the more expensive drugs. These drugs are costing patients and insurance companies thousands of dollars because of copays. Since the FDA Amendment Act of 2007, the FDA has been allowed to put more pressure on the drug companies to perform follow up studies on side effects of their medications under penalty of monetary fines, but again, it means little to Big Pharma. Before 2007, drug companies were very secretive about their failed drug studies and those that had serious side effects that had to be dropped. Now there is more transparency, but these studies need more scrutiny and oversight. The FDA approved for marketing 46 novel drugs in 2017 while rejecting fewer and fewer drugs. Faster reviews mean that the FDA often approves drugs despite limited information, such as approving a drug that shrinks a tumor but no information on clinical outcomes, survival rates, and cures according to an investigative newsroom called ProPublica and published in Medscape, an online journal. Another area of fast tracking happens when a rare disease has no successful treatment, and then a product comes along and shows great promise. The FDA must not approve the marketing of a drug from just one study, in my opinion. The FDA gets its marching orders from the Congress, and there needs to be no influence from pharmaceutical lobbyists. This has actually been going on since 1998 when the “fast track” regulations were created. There are many patient advocate organizations begging for the FDA to streamline creating controversy about this process….safety versus effectiveness!! Medications that are prescribed “off-label” are defined as a medication that is FDA approved for one illness but is used for a different disorder or illness. The FDA approves the labeling of drugs for specific medical illnesses or disorders, not just any illness. Off-label usage implies that there is no scientific reproducible proof that the drug will be effective for any other reason than what it was approved for. Arizona officials have already approved a new rule allowing drug companies to directly communicate with doctors and insurers about alternative uses for approved drugs. Similar legislation is expected in other states. This came about because of a legal battle which ruled the First Amendment of the Constitution does not allow the FDA to prevent manufacturers from providing truthful information about their products to doctors. This also gave pharmaceutical companies the right to bombard our airways with drug commercials. Many doctors begin using certain medications because of small observational studies that have scant evidence they are effective. Drug companies already have FDA approval for at least one indication, and usually will not go to the expense of applying again to the FDA for approval for new indications. This has been true for certain cancer drugs approved for one cancer and not another. Immunotherapy is a good example. Another is a drug still in clinical trials showing great promise, but not yet FDA formally approved. It is designed to get life saving drugs to patients quicker, but at a price. The long term effects of the drugs are rarely studied, and effectivenenss may have been studied for as little as 6 months. This action has opened the drug companies and the medical profession up to legal action. Big Pharma always calculates the legal implications when they develop a drug and rush it through the fast track system if possible. The medical profession does not! Since these drugs have been approved for at least one indication, off-label use is legal but untested by traditional research. Other examples of off-label prescribing are drugs for ADHD and nerve related pain. A study reported that 75% of patients with ADHD (attention deficit hyperactivity disorder) are treated with off-label psychiatric medications (Adderall, Ritalin). Certain anti-depressants (tricyclics) appear to be valuable in certain neuropathy cases. That does not mean they are valuable for chronic back pain, etc., and yet doctors are writing thousands of prescriptions for treating all types of pain trying to avoid opioids. That is where confusion begins. There are different types of pain and have to be treated differently. For instance, the peripheral neuropathy medications (gabapentins—Neurontin, pregabalin—Lyrica) have been studied and are not effective for chronic back pain (previously reported), and yet doctors today are continuing to prescribe it in an attempt to avoid opioids. These medications have side effects and are not to be taken lightly. Many patients will still get the benefit from the placebo effect from any drug. Studies are ongoing trying to find non-opioid medications that give doctors hope that their patients can get relief without opioid dependence. Physicians are eager to help patients especially when other drugs are not working. This is a medical dilemma that the profession deals with in many situations especially life threatening illness. One fifth of drugs are used off-label (prescription and OTC). A recent study reported that 30% of cancer drugs are off-label (the new immunotherapy, targeted and biologic drugs). There is a reason drug companies spend millions on TV commercials for Keytruda for non-small cell lung cancer. It is off-label. But in this case, if a patient has a certain gene mutation (PD-1), the drug is showing remarkable help for some of these patients (extension of life for a few extra months on the average), but there are extremely toxic potential side effects for anyone who receives it. In fact, off-label drugs have been proven to have more side effects. It all comes down to risk/benefit, but when people are desperate, they do not think clearly and will do almost anything in desperation to find a magic cure, including totally bogus treatments readily available outside this country spending “every dime” they have to no avail. Physicians are not discouraged to use off-label drugs if they feel, with some scientific proof and clinical judgment, a medication is appropriate especially if there are few side effects. The key is for physicians to explain in detail to the patient that it is not FDA approved and may have potential side effects but worth a try when other medications are not working. I am inclined to think that is not happening enough. President Trump also signed a Senate bill that allows patients who have tried other medications unsuccessfully have “the right to try”, an experimental medication that has not been proven (still in clinical trials) that may give them hope for the immediate future. The pharmaceutical industry was tapped to help pay for these drugs in these patients, an attempt to shunt some of the cost back to Big Pharma. Again, this program gives hope and in selected cases, and I am sure there will be some great successes, but there are critics of this senate bill, as one might expect. When U.S. Governmental personnel (late 2016 to August, 2017) were on diplomatic assignment, they were exposed in their hotel rooms to high pitched sounds, and 21 of the 24 these people developed a cluster of neuro-otological symptoms including auditory and sensory phenomena both acute and prolonged. Most developed hearing loss, ear ringing and pain, dizziness, visual abnormalities, headache, cognitive, and sleep disturbance. There has been little information on these individuals although the University of Pennsylvania Department of Brain Injury has been studying them and finally published their findings in the JAMA in February, 2018. Their experience was classified for a time. The cognitive difficulties kept many from going back to work for months. Problem solving, difficulty concentrating, memory, resulting in mood disturbances, mental fog, irritability, etc. These symptoms can also occur from a head injury and are common with patients taking chemotherapy. These symptoms kept most of these personnel from returning to work especially with their types of job responsibility. However, most had desire to get back to work, which might rule out mass malingering. Another diagnosis was considered—mass psychogenic ilnness, defined as a rapid spread of illness with signs and symptoms affecting members of a cohesive group originating from a neurological disturbance involving excitation, and loss or alteration of function. Physical complaints exhibited unconsciously have no corresponding actual organic cause. This occurs more commonly in women (half of the patients were female). This is similar to mass hysteria, however, there were several factors that pointed away from this diagnosis. All these diplomats did not know each other and occurred at different times. The cause and source of these neurological symptoms has been suspiciously kept out of the media until this JAMA report was published. There have been no other groups of visitors to Cuba experience such symptoms. Supposedly viral and chemical exposure have been ruled out. Most complained of these symptoms for longer than 3 months. One theory is that some type of sonic wave surveillance device was being used to easedrop on conversations by diplomats, and the system went afoul. Many “Cold War” tactics have been pulled on diplomats over the years in Cuba but never any physical attempts. This also affected some Canadian diplomats as well. MRI scans were inconclusive but I suspect more sophisticated studies are under way privately and are still classified. Since this story broke, 16 Cuban diplomats have been expelled from the U.S. to underscore that the Cuban government bears some responsibility. The Cuban government denies any involvement and has pledged cooperation in the investigation. Our embassy remains open as does the Cuban Embassy in the U.S. Cuba is still run by a communist regime. In January, 2018, the State Department issued a level 3 warning to Americans about visiting Cuba, but it hasn’t stopped Cruise ships from crowding their harbors. It will be interesting to see how this plays out. It was reported in the NY Times on May 23, 2018, that a government official in Southern China had signs of possible brain damage after reporting disturbing sounds and sensations in their hotel rooms, which was reported by the State Department. These symptoms paralleled the same mysterious ailments that struck the American diplomats in Cuba. Secretary of State Mike Pompeo stated that a medical team was being sent to Guangzhou to address the situation. As of this report, there has been no further information. Both Cuban and Chinese officials have denied any role in these issues now in two countries. U.S. Senator Rubio, R-Fla, questions that Russia might be playing a role. Stay tuned to a story that is very interesting. If you are interested in mass psychogenic illness, search Wikipedia. Many advances in combating the opioid crisis have occurred since my first report in April on managing pain. There are consequences when major attempts are made to reduce prescriptions for opioids. One consequence is overutilization of non-opioid medications that have side effects and are not near as effective. There has been a significant increase of off-label use of epidural injections with Depo-Medrol (longer acting corticosteroid) along the spine by pain management specialists. I described these injections in detail when I reported on the specialty of Pain Management. We might think that considering some type of psychological care would not automatically be considered an integral aspect of treating chronic pain, but just consider how pain affects a patient not only from a physicial standpoint but how it affects quality of life creating every day a tremendous challenge to just get up out of bed and go to work, enjoy sports and other recreational opportunity. The Society of Behavioral Medicine has been very verbal about access to psychosocial care to prevent opioid addiction and truly assist in the care for those in pain over a significant period of time. With the concept of integrative care for chronic pain, it is essential that access to mental health care must be considered by physicians when coping skills for patients and more standard treatment is not working. Underlying psychiatric and home dysfunction may be blocking the value of other therapies. In NEJM-General Medicine, cognitive behavioral therapy was studied in 2608 patients (average age 72) to see its effect on reducing chronic pain. It involved coping skills training, cognitive restructuring (prioritization of pain in a person’s life) and behavioral activation (being proactive in dealing with the reality of pain and its effect). Back and arthritic pain were the most common type of chronic pain (all had this chronic problem for 3 months or longer) treated with this therapy. Treatment duration was approximately once a week for 9 weeks. It was proven to lessen pain significantly for at least 6 months after therapy stopped, however, its value diminished after that. Nothing lasts for patients in chronic pain. Authors of a governmental committee (Sociey of Behavioral Medicine Health Policy Committee) have suggested 10 policy recommendations to further the cause of psychosocial care. 1) Access to care must be increased in all healthcare systems. 2) Remove the barriers for initiating such a provision to provide effective psychosocial counseling. 3) Ensure competence in psychosocial pain care in providers which is lacking. 4) Insurers must cover referrals for this type of specialty care in facilities where pain is managed. This is a major blockade to referrals. 5) Referral to psychosocial specialists must be a routine part of pain care when appropriate. 6) Healthcare facilities must make this type of care a priority and available in their management of pain. 7) Education for behavioral therapy should be a part of chronic pain managment across all fields of medicine including medical and nursing schools regarding this issue. 8) Formally recognize the specialty of pain psychology. 9) Different models of pain psychology care must be examined to determine best practices. 10) Dissemination of evidence based model delivery systems to major healthcare facilities. There is some pushback from facilities and physicians who do not have the time to be trained in this area of pain management, but only with public support can we encourage our lawmakers, insurers, and healthcare facilities that this is a priority. Reimbursement is another serious issue. Mental healthcare has been the step-child of medicine forever. Psychological or social psychological counselors are quite capable of addressing this issue, however, this will probably require some updates in their education as well. Additional programs are badly needed. With school shootings, emphasis on the opioid crisis, and improving mental health (it is an overarching issue), I am encouraged that our healthcare system will get to work on this issue. But it will not be successful without insurance reimbursement and major acceptance as a viable option for chronic pain management. 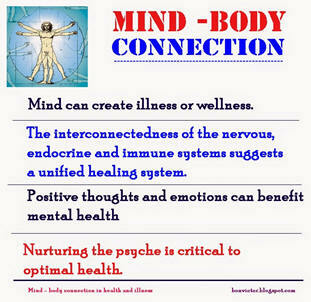 The relation between mind and body must not be denied. 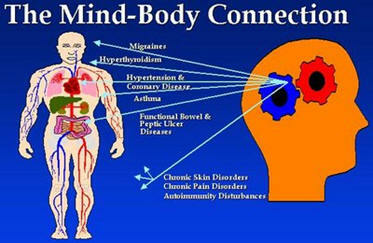 Most believe that health and disease is influenced by the mind, the body, and the spirit. Thoughts, emotions, and behavior are shaped by all three. Every doctor dealing with pain must keep this in mind to be effective. Most of the complementary methods of pain management are based on these principles. Leaving out the mind/body connection will not allow a physician to treat the patient as a whole person, and pain is a perfect example. There are scientific studies to prove this connection. Scientists at Northwestern University studied 39 patients with back pain and performed brain scans at 4 different points during treatment. At the end of a year, 20 patients recovered from their painful condition, and 19 developed continued chronic pain. By comparing brain scans, with an 85% accuracy, they could predict those who went on to develop chronic pain. Those with greater interaction between 2 locations of the brain that involve emotions (the prefrontal cortex and the nucleus accumbens), had higher chances of developing chronic pain. The scientists felt that the greater the emotional response the higher the chance for chronic pain….something we all know. This is the basis for psychosomatic medicine, and one of the early proponents of this concept was one of my favorite medical school professors, Dr. Stewart Wolf at the University of Oklahoma Health Science Center. Today, it is assumed that most people understand this concept, but physicians and patients may not incorporate therapies that include this concept to help benefit their bodies. Mind body techniques have known value in various aspects of medicine. 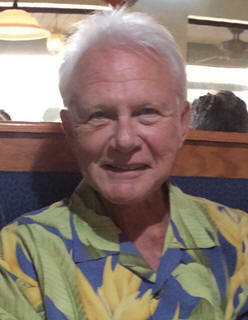 Any form of relaxation will assist pain management including meditation, yoga with breathing techniques, biofeedback, guided imagery, massage therapy, prayer, relaxation therapy, aromatherapy, art therapy, and other non-traditional methods will respond positively to reducing pain. Hypnotherapy can also be very valuable in selected cases. These techniques may have no better result than a placebo, but if a person, for instance, has a devout belief that prayer will benefit them and others, it should be included in any integrative medicine approach to managing chronic pain. Some believe that there are energy fields around the body and they can be manipulated by changing the aura, chi, or prana. Some believe illness changes energy fields and if the field is rebalanced, it can influence illnesses including chronic pain. Of course, solid research does not exist to prove these techniques are any better than the placebo effect. However, recent research is now proving these techniques to be better than just the placebo effect. Because there are many cultures in the U.S., many of these eastern and alternative therapies are readily accepted, but physicians are lacking in knowledge about these techniques. The opioid crisis has required the field of medicine to broaden their thinking. If mainstream medicine is serious about using integrative medicine, they must learn about these alternative forms of therapy and utilize them in selected cases. If physicians can express an open mind on using these techniques, some of their chronic pain patients may benefit. This includes ayurveda, homoepathy, naturopathy who may use very small amounts of herbs and supplements to stimulate the immune system, diet, exercise, and massage to address many conditions including pain. It is time some these overarching concepts and different approaches are used by mainstream medicine. Holistic medicine has endorsed aromatherapy for centuries to connect the mind and body by promoting balance, harmony, and promote health including managing chronic pain. Some of these essential herbal oils can be consumed, inhaled, or used topically. Evidence based research is scarce as are many of these alternative therapies but used as a complement to other treatment modalities have shown some significant value. According to www.aromatherapy.com the 10 most commonly used oils are bergamont (Southeastern Asian citrus tree), cedarwood (from Juniper Virginia trees), chamomile (leaves of the plant), eucalyptus (Australian tree), jasmine (from a Chinese evergreen), lavender (from the plant leaves), lemon, marjoram (from the leaves of the herb), patchouli (from the plant Pogostomon cablin), peppermint (herb), rose, rosemary (herb), sandalwood (tree), tea tree (leaves of the Melaleuca alterniforia tree), and ylang-yla (from the tropical tree). Most of the pain patches over the counter have eucalyptus and camphor in them, and they cool the skin seemingly relieving pain but may they also be working through the aromatherapeutic chemicals in them. Capsacin comes from hot peppers and has been shown to be of value temporarily in relieving soreness and chronic pain. Even Vicks salve has value for the airway with the aromatic menthol, camphor and eucalyptus ingredients. 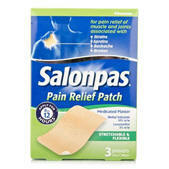 There are lidocaine and diclofenac (Voltaren) patches are two of the most common that used regularly and are absorbed locally to relieve pain in that area. These have no aromatic component. 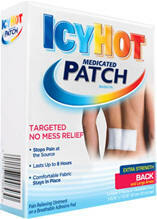 Voltaren patches require a prescription and have potential side effects (heart) if used frequently but are effective in some cases. Although the internet has many sites that make false claims about miracle cures, it is the patient’s responsibility to do their homework before going to some of these providers and always discuss it with their primary care doctors. Does Cannabis help chronic pain? There have been some studies that state that cannabis helps pain, but for those with chronic recurrent or continuous pain, the evidence is quite antecdotal. A study in Australia bears some light on this subject as reported in the Lancet, an very reputable British medical journal in 2018. A questionnaire was given each year for 4 years to 1514 volunteers through the country’s pharmacies. These patients had been prescribed opioids for pain. At the beginning of the 4 years, 24% used cannabis for chronic pain and 60% after. They were questionned regarding the type of pain and duration, and associated anxiety and depression. At the end of the 4 years, most of those using cannabis noted increasing severity of their pain, and most noted that cannabis did not reduce their dependency on opioids, and had more anxiety. They concluded that there was no value using cannabis in improving patient outcomes for chronic pain relief and did not allow these patients to reduce their use of opioids. As the U.S. seems hell bent on legalizing cannabis, there is little scientific proof that those who use pot for chronic pain relief are making excuses for staying stoned. Obviously many more studies are necessary to evaluate the true value of cannabis in medical conditions. Most people who use cannabis also tend to abuse other substances, and that is a fact. Next month, I will report on health and spirituality.